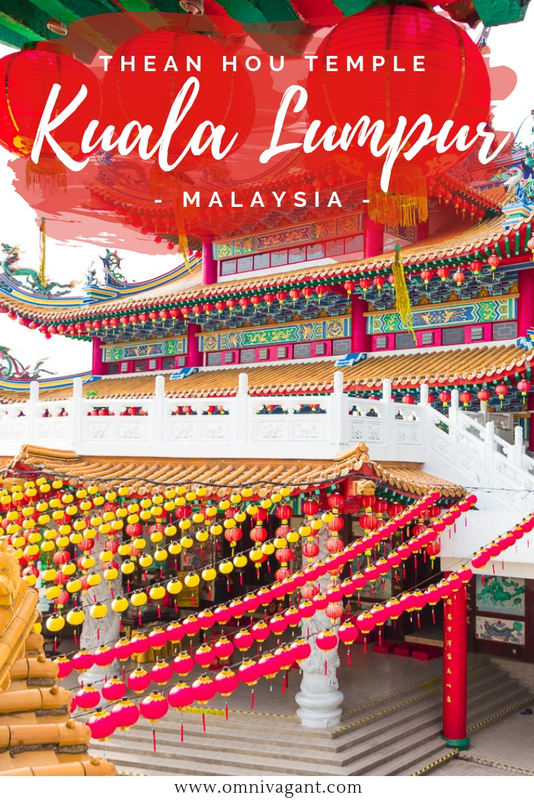 Kuala Lumpur is a melting pot of cultures, and as such has a large amount of religious sites to explore; from Hindu temples and mosques to Buddhist temples. 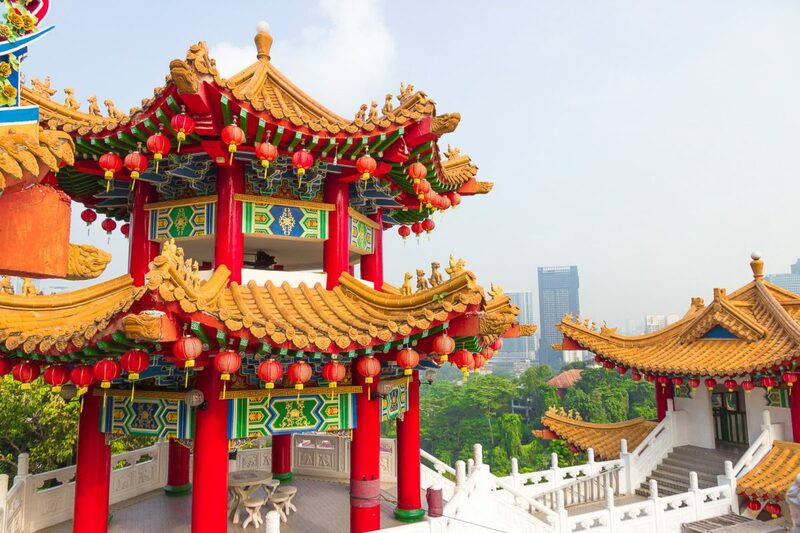 But even if religious sites are not your to go to activity when exploring a city, there is one particular temple that you might want to include on your Bucket List: the Thean Hou temple. A 6-tier temple, rich in colors and offering an impeccable view over Kuala Lumpur, truly one of the most beautiful temples I have seen in Southeast Asia. 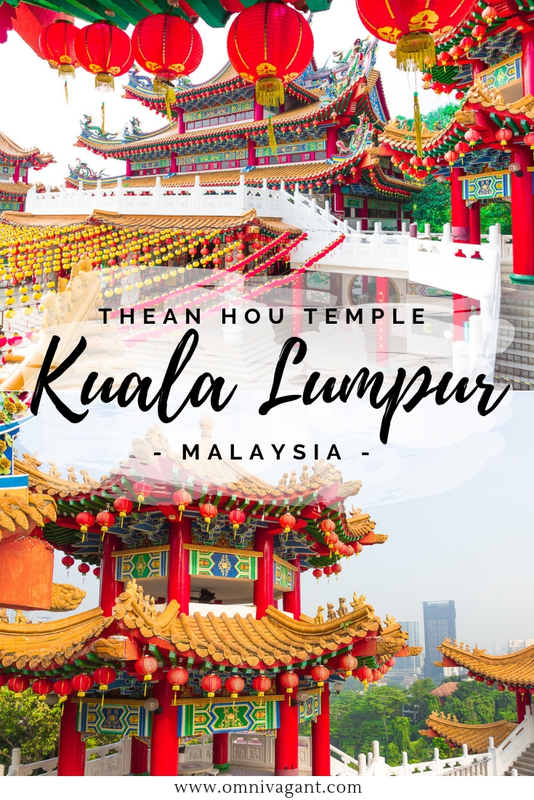 The Thean Hou Temple is one of the largest temples in Malaysia and Southeast Asia and was not completed till 1987; officially opening its doors in 1989. Since then it has been a popular site visited by hundreds of tourists on a daily basis. Intrigued? 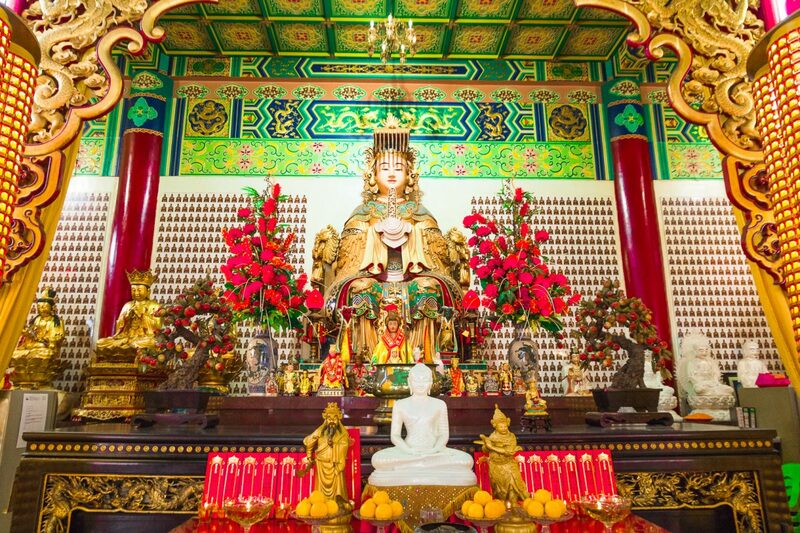 Find more info on visiting the Thean Hou Temple below. The Thean Hou Temple is located in Kuala Lumpur, Malaysia’s capital. Malaysia’s capital is filled with stunning sites such as the Batu Caves. The temple is located Southwest of the city on top of a hill, offering a great view for its visitors. 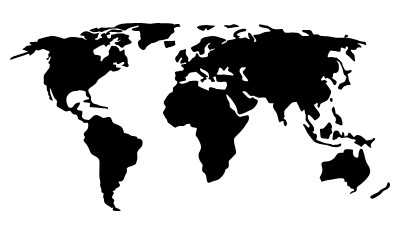 Find a map below to help you! Option 1 (for the budget travelers), via public transport – Kuala Lumpur has quite an extensive public transport network, making it easy to make your way through the city on a budget. And the best thing is, it is fairly cheap. From wherever you are located in the city find a metro or monorail to KL Sentral. Prices are depending on your location but I would say are roughly between 1 – 4 MYR per person, one way; you can use Google Maps for an accurate price of your trip. From here it is a 30 min walk (including the last 700m uphill) to the temple. The walk will take you through little India, over a highway and to the hill where the temple is located. I would recommend using Maps.me for an accurate walking route on your phone to be sure you won’t get lost on your way! Example cost from Bukit Bintang: Monorail ticket one way 2.5 MYR. Option 2 (for the non budget travelers or travelers that don’t have a lot of time) use Grab – Grab is an app that is very commonly used in Southeast Asia, it is kind of the same like Uber, with some countries (such as Vietnam) offering rides on the back of motorbikes instead of cars. Download the app, type in your pick up point and your destination and the app will find you a driver. No need to connect your creditcard, you can pay the driver in cash upon arrival. I have used Grab many times in Malaysia, and have never been disappointed. Just be sure you have wifi on your phone, or a local sim card, to arrange a driver and to arrange to be picked up again from the Thean Hou temple once done with your visit! Example cost from Bukit Bintang: Grab Taxi one way 16 MYR. Opening Hours Thean Hou Temple: the opening hours of the temple are from 8am to 10pm. I would recommend going as early in the morning as possible, as around 9.30am tour buses will start arriving making the temple a lot busier, and in my opinion, less pleasant to visit. As Kuala Lumpur has quite a tropical climate I would also be sure to check the weather in advance as walking up hill during mid day, when the sun is at its highest, is not always recommended. Entry Fee for the Thean Hou Temple: Free. Yes, you read that correctly, you can absolutely enter the temple for free, a perfect activity if you are traveling Malaysia on a budget. If you want you are welcome to make a donation at the temple it self. Dress code for the Thean Hou Temple: While there is no dress code for visiting the Thean Hou temple I would recommend anyone to dress as appropriately as possible (meaning to cover knees and shoulders in most cases). 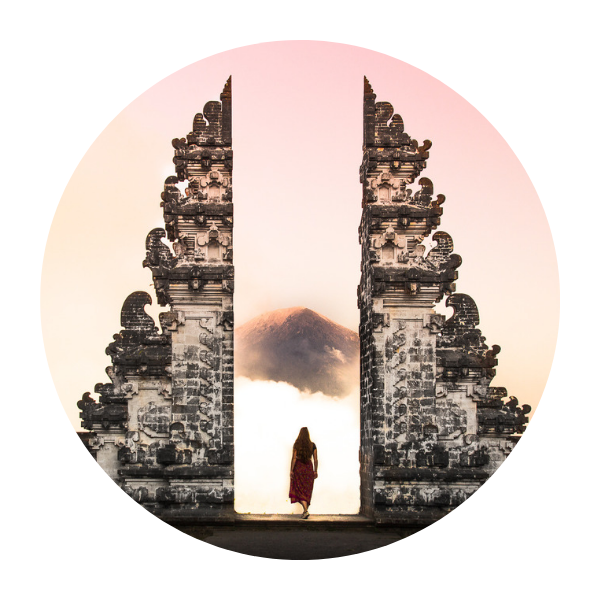 However, you are welcome to enter the temple in shorts, and contrary to other religious sites, you won’t be denied access or are alternative clothing options provided. Okay, so now that you are fully prepared and ready to go, here is what to expect when visiting the Thean Hou temple. 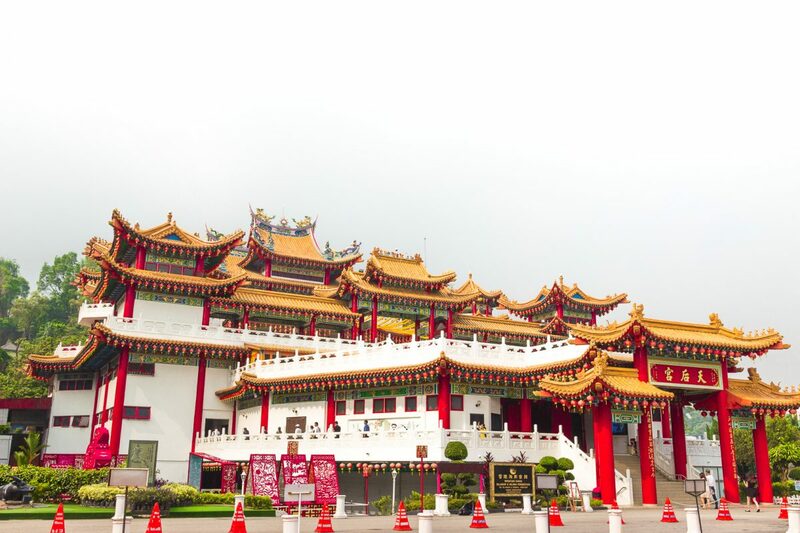 While the Thean Hou temple does not look specifically appealing to the eye when first driving up, the 6 tier structure has much to more offer once you head to the temple, located on level 2. The temple was constructed between 1981 and 1987 and is a syncretism of element of Buddhism, Taoism and Confucianism. The temple combines traditional architecture with more modern architecture, and is very rich in colour, a true mesmerizing site when first entering the temple. 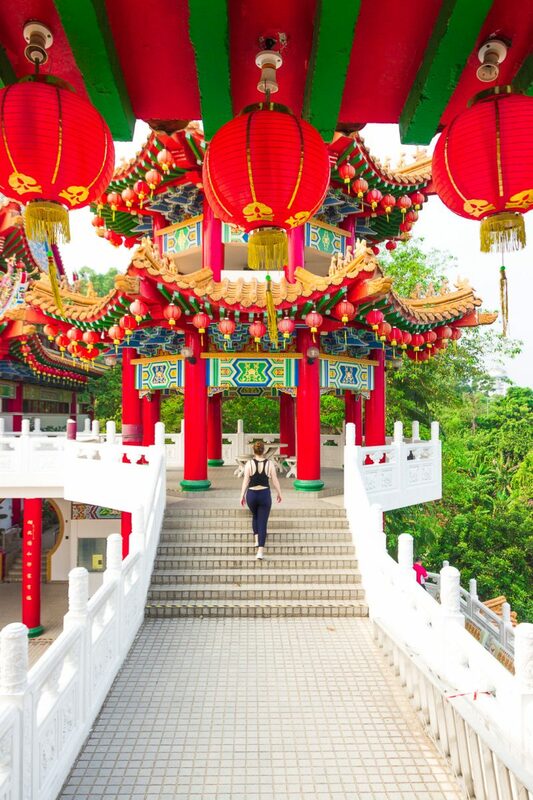 You will find dragon inspired decoration on the rooftops and colorful lanterns, red and yellow, welcoming you into the temple. 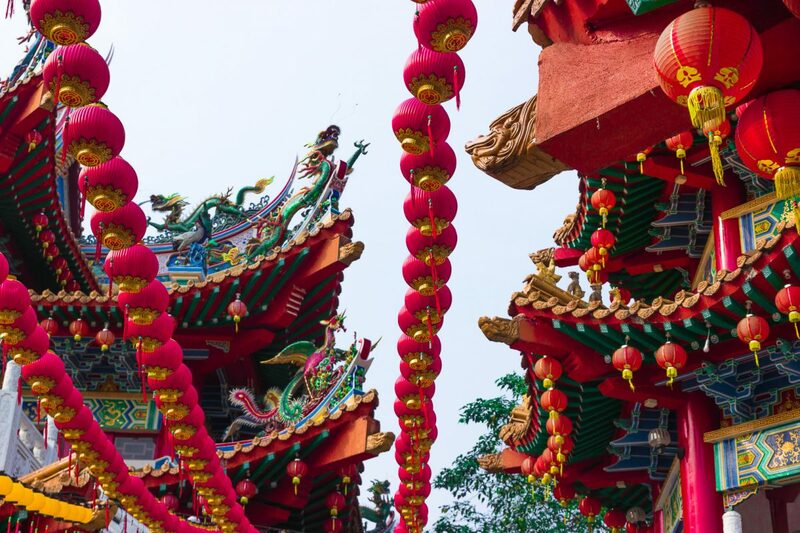 The Thean Hou temple is home to three different goddesses, Tian Hou, the goddess of heaven that is said to protect fishermen, Guan Yin, the goddess of mercy, and Shui Wei Sheng Niang, the goddess of the waterfront. You can find a statue of each of the goddesses inside the prayer hall. Outside the temple you will also find a small section of a garden filled with the 12 zodiac signs and a small tortoise pond, located near the entrance. Interested in seeing more temples in Malaysia? 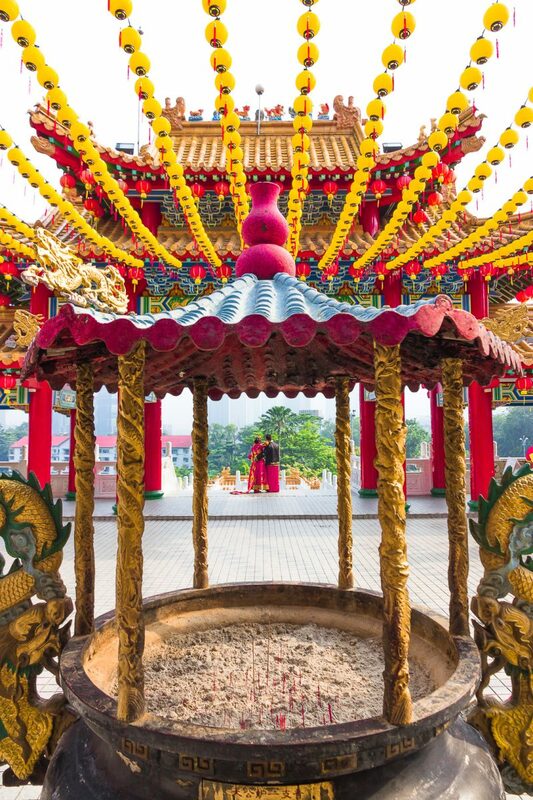 Check out our article about the Kek Lok Si Temple! For budget travelers – Use Hostelworld.com to find the perfect (budget) hostel for you. I have stayed multiple times in a dorm room in the Reggae Mansion, and could definitely recommend it to budget travelers who love to party. The hostel offers large and spacious pod-style dorms with large lockers for all your lockers. The hostel also has a restaurant, a small cinema and a rooftop bar, with a great view, that is opened daily. For any type of traveler – Another great option for any traveler is to use AirBnB to find affordable but quality accommodation. There is a large offer available on AirBnB. We have stayed at this AirBnB, and for the same price as a private room in a mid range hotel we now had a pool and a gym to us available, an amazing view from the 24th floor in a top notch location with only a 5 min walk away from public transport, a large shopping district and food courts. 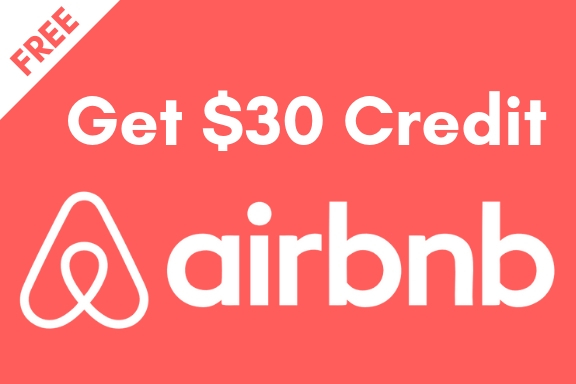 And to make it even better, you can now book this or any other AirBnB with a 30$ discount by clicking here! For the big spenders and luxury seekers – Booking.com offers a large range of luxury hotels in the city with pools, gyms, breakfasts included and much much more. Some of the more well known luxury hotels in Kuala Lumpur are the The Traders Hotel, The Grand Hyatt and the Mandarin Oriental. Accommodation – hotels, hostels and guesthouses are widely available in Malaysia’s cities, smaller towns and islands. For the budget traveler I would recommend using Hostelworld.com to find the best hostels, including hostels with dorms, or to opt for budget accommodation from Airbnb.com. To make it even better, if you use this link to sign up for AirBnB you can get a 30$ discount on your first stay! If you are looking for luxury accommodation I would personally recommend using Booking.com to explore your options all around Malaysia. Transportation – Malaysia has an extensive network of public transportation available with tickets easily booked online. For flights check out Skyscanner for the best deals. If you are moving smaller distances between cities, or you are on a budget, I would recommend using Red Bus to book your busses online cheaply and reliably. Health & Insurance – Depending on what area in Malaysia you are planning on traveling to you might need to get vaccinations and/or malaria pills. Be sure to visit your GP or any travel clinic for accurate and current advise on these matters. Also, be sure to get Travel Insurance before leaving your home country, as you never know what might happen on vacation. 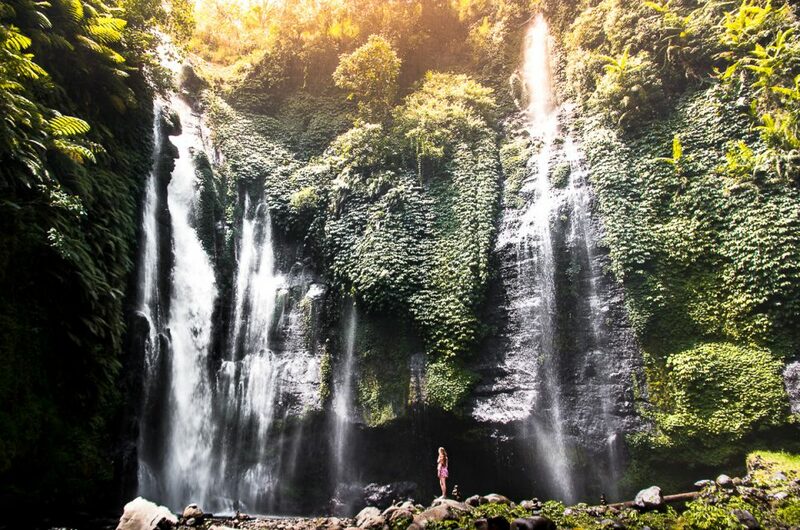 Lonely Planet recommends using World Nomads for travel insurance! I hope you enjoyed reading this post about the Thean Hou temple. 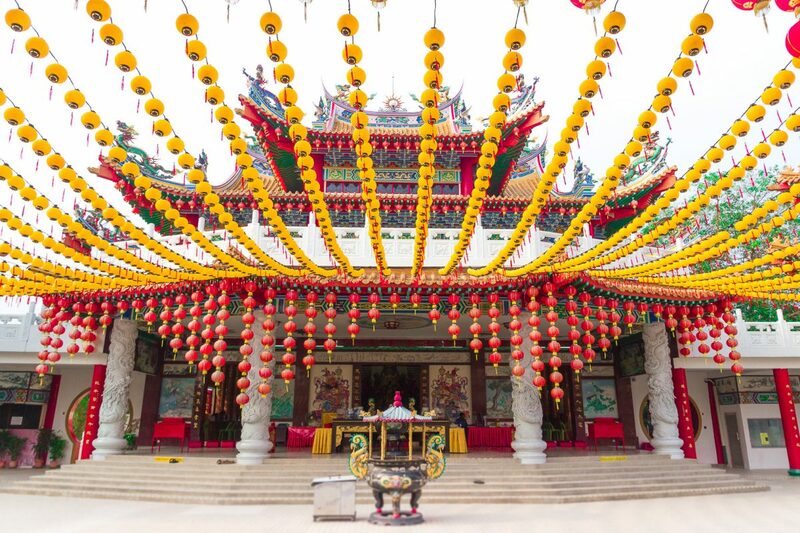 Let me know in the comments down below if you are planning on adding the Thean Hou Temple to your next bucket list! Don’t forget to read my full travel guide to Peninsular Malaysia as well if you are planning on visiting this beautiful country or check out all our articles on Malaysia here. What a stunning post! 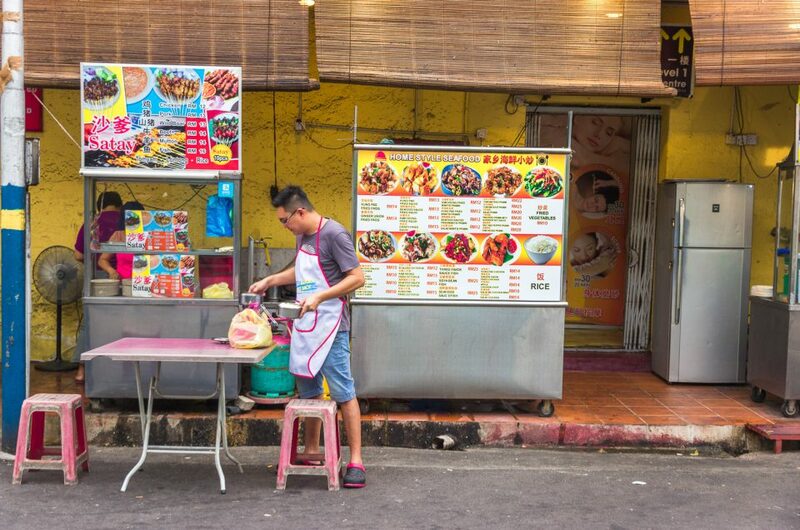 Your photos really make me want to visit KL again! Thanks! You really should, it is such an amazing place! I love that you included accommodation options for people with different budgets! I’m definitely someone who is very wishy-washy on splurge vs shoestring so I’m so glad you gave a little description of each. I absolutely love the guide and all the useful info! Thank you so much! Thanks Anshula! So kind of you, happy you enjoyed the article! I think this is the first time I hear about this temple in Kuala Lumpur. It is so colorful! I really like places like this. After many years of high plane tickets, the prices to Singapore and Malaysia have started to drop (from Los Angeles). I hope to visit soon. Thanks Ruth! I can only imagine, I hope the prices drop soon. Both Singapore and Malaysia are worth a visit. Wow your photos are stunning! Visited this temple in KL before, but after seeing your post, I definitely want to head back there and take in all the sights! Thanks Yazhini, that is so kind of you. I just absolutely loved the colors of the temple, I could wander around for hours there! This is such a beautiful temple. I can imagine that the peace of being there is incredible. Thank you for giving such a detailed post outlining all that is needed in order to visit. I’ll definitely be saving it for future reference. Thanks Michelle! It is such a peaceful place, in the city, but still far away enough to enjoy the silence and admire the view. Thean Hou Temple looks great. Hoping to get there this winter. Thanks for your comment Sue! It is a must see when visiting Kuala Lumpur in my opinion, I hope you get to enjoy it this winter. Thanks Tiff! It is such a beautiful place, I would love to go back one day!